When the Trump administration announced last week that it was imposing tariffs on solar cell panels mostly coming from South Korea and China, it appears that the progressive blogosphere was almost unanimous in condemning the action as an attack on solar energy. The tariffs should be attacked, but not because they are tariffs, not because they are protectionist, not because they may lead to less imports of panels and therefore the loss of jobs of people installing them. The tariffs should be attacked because they are not accompanied by a robust industrial policy that will help USA manufacturers replace panels no longer being imported, by panels of domestic manufacture. Protectionism is an issue on which the Democratic Party and the left in general are very vulnerable. Basically, they have forgotten the actual history of industrial development: every single country that successfully industrialized did so behind trade barriers. Many readers may not believe me, but it is historical fact. For a relatively short but full explication of the fact that protectionism works, I point you to James Fallows� December 1993 article in The Atlantic, �How the World Works.� For an entire book on this topic, the best is probably South Korean economist Ha-Joon Chang's 2007 book, Bad Samaritans: The Myth of Free Trade and the Secret History of Capitalism, available as a large pdf file here. An excellent review of Chang�s book, by Chalmers Johnson, is here. We like to taunt our conservative and libertarian opponents that you are entitled to your own opinions, but you are not entitled to your own facts. Well, the same applies on this issue, and to the neoliberals amongst us: you are entitled to your own opinions, but you are not entitled to your own facts. The facts are clear that historically, countries that successfully industrialized did so behind trade barriers that protected their infant industries, and protected the earning power of their working people. The facts are equally clear that since the imposition of economic neoliberalism and free trade on developing countries, and their enforcement by the World Bank, the International Monetary Fund, and other international NGOs, not to mention the USA government and others, the growth rate of the national economies of developing countries has been LESS than it was before neoliberalism and free trade. Those are the facts, and all the crap you were taught in college economics courses will not change them. But protectionism alone does not work. There must be a national industrial policy to promote and encourage the development and growth of new industries. As originally developed by George Washington and his Treasury Secretary, Alexander Hamilton, and later in the 19th century by Henry Clay, Henry Carey, Abraham Lincoln (on Lincoln, see one of the best overlooked books on historical political economy, Lincoln and the Economics of the American Dream, by Gabor S. Borit, Memphis State University Press, 1978)., and others, protectionism was one pillar of a three-part program for national economic development. The other two were a national banking system, and internal improvements (what we today call infrastructure). Also, American economic thought � outside the oligarchical slave south � in the 19th century was dominated by the now forgotten Doctrine of High Wages. According to this doctrine, there was a virtuous circle in which paying labor high wages allowed labor to avoid penury and the bodily and mental exhaustion that accompanies it, making labor more productive and thus generating the ability to pay labor high wages. It was explicitly recognized that to force Americans to compete against the poorly paid labor of the British empire (in the dreadful conditions of industrial Birmingham and London as well as the wretched poverty of India and other colonies) was crazy. 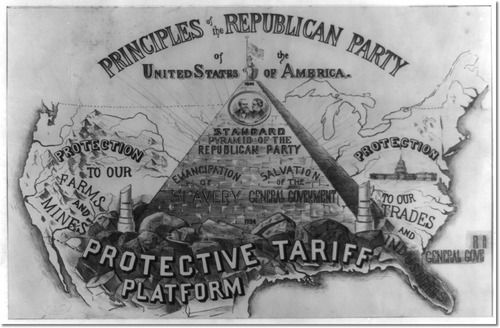 In the Conclusion to his 1851 book, The Harmony of Interests: Agricultural, Manufacturing & Commercial, Carey wrote that the British system of free trade "looks to pauperism, ignorance, depopulation, and barbarism," while protectionism and the American School of political economy aims "to increasing wealth, comfort, intelligence, combination of action, and civilization." The history of a national banking system is now obscured by Jackson's demolition of it during the 1830s fight over the rechartering of the Second Bank of the United States. But the key point was that financial activity must be steered toward productive investment and away from mere speculation and "stock jobbing." Hamilton set down a firm and concise test in The Federalist Papers number 15: "Is private credit the friend and patron of industry?" Today, that would mean a severe crackdown on the over $5 trillion a day of trading in stock, bond, futures, options, and foreign exchange markets, as well as seizing the estimated $50 trillion in hot money sitting in tax havens around the world. A tax on trading in the financial markets would go a long way to eliminate much of the speculative trading, and shift the socially harmful short term outlook of financial markets to a more long term outlook more attuned to the real economy ordinary people experience day to day. High frequency trading in particular, since it serves no economically productive or socially useful purpose whatsoever, needs to be eradicated. Internal improvements were carried into effect by dozens and dozens of government programs and projects, beginning with the building of lighthouses under the direction of Treasury Secretary Hamilton. Even Hamilton's political enemy, Jefferson, engaged in internal improvements � sending out the Lewis and Clark Corps of Discovery to explore and map the northwest, followed by similar Army expeditions � almost completely forgotten today � to the southwest, to explore the Platte, Arkansas, Canadian, Red, and upper Rio Grande Rivers of the lower Great Plains. Army officers leading these expeditions included Stephen H. Long and Zebulon Pike. Altogether, over 40 Army expeditions would be sent out over the first half of the 19th century, and the information they returned with enabled the vast overland migrations to California and Oregon. In the 1850s, Army engineers led survey expeditions to select the route for transcontinental railroads. There were many other government programs besides these Army expeditions. There were Navy expeditions to the South seas and the Antarctic, which brought back specimens which formed the basis for creating the Smithsonian Institution. There were programs to build roads and canals, harbor improvements, and improvements to river navigation. There were clean water and sanitation projects carried out by state and municipal governments. There was direct funding of Samuel Morse to build the telegraph, and direct Navy funding of experiments to determine the most efficient designs of steam engines. There were state and national programs to study problems of agriculture, and to find, introduce, and develop new animal and crop breeds more resistant to the pests and germs of North America. There were deliberate policies to spread the new technologies and capabilities of metalworking machine tools from the national armories where they were first designed and developed, to general industry. Without these two other two pillars � national progressive banking, and massive infrastructure programs � and a discontinuation of the war on the wages and benefits of American workers, then Trump's protectionist attempts to reverse the deindustrialization of the USA economy will be largely ineffective. There also remains the problem of avoiding a trade war. There are too many brainwashed so-called progressives who aggressively characterize critics of free trade as �isolationists� and jingoistic �economic nationalists.� Again, they may have their own opinions, but they may not have their own facts. And one important fact going forward is that the world desperately needs $100 trillion in new investment to build energy and transportation systems that run on renewable energy sources alone. The present world trade regime was designed mostly by people working for multinational corporations, and is designed to take advantage of sources of cheap labor that can be exploited to make cheap, increasingly shoddy consumer goods, and to avoid taxes on the resulting high profits. Proponents of this trade regime claim it has helped lift millions of people in developing countries into the middle class. Why then has so little progress been made in areas such as providing access to clean drinking water, waste disposal and treatment, and public mass transit? Why are growth rates for most developing countries slower under this regime than they were before it? The present world trade regime must be discarded, and replaced with a world trade system which promotes national economic development of the industry, agriculture, and infrastructure of all nations. This must include strict limits on speculative and hot money capital flows. This means negotiating with countries like Algeria � not to open up their markets to speculators and usurers, but to assist them in acquiring and developing the scientific and technological knowledge to build their own fresh water systems, renewable energy systems, and transportation grids. Algeria wants to build its own automobiles and eliminate imports. This desire should not be attacked and disparaged as contrary to free trade, but encouraged as a solid way of providing high paying jobs for Algerians. And it should also be encouraged to be steered in such ways as to move beyond internal combustion engines as quickly as possible, to electric vehicles. There are hundreds of millions of people across the globe without access to clean water, without indoor plumbing, without heating or cooling. How many steel plants and plastics plants are there in Africa that produce pipe? How many factories are there in Africa to produce valves, faucets, gaskets, grommets, nuts and bolts? If there are not any, rich countries like USA have a moral obligation to help establish them, and get them running. And NOT for exporting all this new pipe, valves, and faucets back to USA or other already developed markets. In sub-Saharan Africa, 70 percent of people live with no access to electricity. Yet there is enough solar energy hitting one square kilometer of desert in Africa to supply all the electricity needed -- in all of Europe as well as Africa. Deploy enough photovoltaics, and Africa has a huge surplus of energy it can export to Europe. There is no reason that these solar cells can�t be built by countries in Africa. No reason except plain racism, and blind ideological faith in free trade. We need a new world trade system based on actual national development of industries and domestic markets in the less developed countries. Free your mind of its free trade lies!